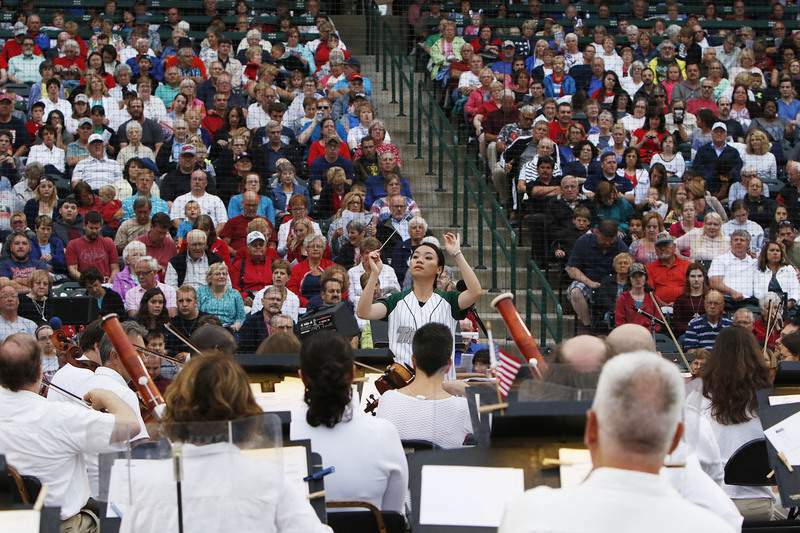 Photos by Chad Ryan | The Journal Gazette Conductor Chia-Hsuan Lin leads the Fort Wayne Philharmonic during Sunday’s Patriotic Pops concert in front of more than 7,000 people at Parkview Field. Tina Thompson claps along as Heaven Marcum, 9, laughs with her at Sunday’s Patriotic Pops concert. They began gathering more than three hours early. Moms and dads and grandparents and grandkids, some with plastic containers of brownies and bags of homemade popcorn. Others with juice boxes and Cheerios. The little ones in PJs, clutching their blankets and a favorite toy. The adults dressed in shorts and sandals. Everywhere you looked, it was red, white and blue. 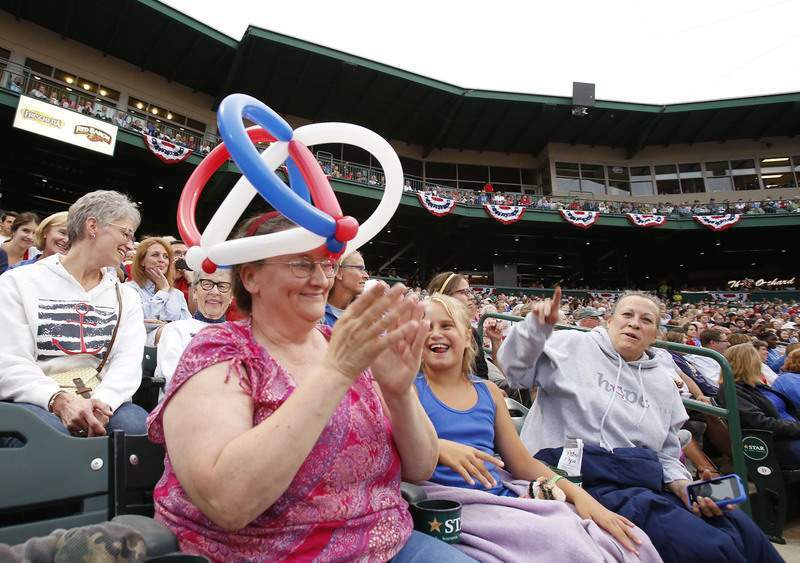 It was July 3 at Parkview Field and the TinCaps were out of town, wrapping up a series with Lake County, but the stadium was prepped for a full house. Bunting decorated the skyboxes and lines were building at the concession stands. About 8 p.m., ushers began seriously working the aisles – scooching people together to find space for those still flowing into the park. By the time members of the Fort Wayne Philharmonic took their seats on the temporary stage in the ballpark’s infield, just before 8:30 p.m., it was standing room only and you could hear the whispers of anticipation. It has been about two decades since the orchestra performed its first annual patriotic concert and, for many Fort Wayne families, it is a deeply entrenched tradition. On this evening before Independence Day, the orchestra was about to present a spirited gift to those 7,500 in attendance. The 90-minute free show, which concluded with Tchaikovsky’s "1812 Overture" and a sky full of lights and booms, was the third edition of "Patriotic Pops at Parkview Field" and was by all accounts the biggest one yet. If you think there were a lot of marches and patriotic music, you would be right – starting with "Star-Spangled Banner" and including a sing-along to "America, The Beautiful," "My Country! ‘Tis of Thee" and "God Bless America," to name but a few. The audience was not as finely tuned as the orchestra, but it was loud and proud. And for at least a few minutes, we put aside differences and celebrated the birth of the nation. As the orchestra played the theme songs for each of the branches of the armed forces, veterans of the Navy, Air Force, Marines, Coast Guard and Army were encouraged to stand for recognition. Some needed help to get to their feet, but they stood straight and tall while the orchestra and audience saluted them and their service. Conductor Chia-Hsuan Lin and the Fort Wayne Philharmonic are more evidence of what makes Fort Wayne special. Sixty musicians and staff of the Philharmonic spent the week ending on July 4 sharing their passion and patriotism not just with Fort Wayne, but also with crowds in Steuben, DeKalb, Kosciusko, Noble and Wells counties. And on this night at Parkview Field, those cheering at the 2016 version of "Patriotic Pops " seemed to be especially aware and appreciative.